Scarecrow is one of the rarest wines in the world, averaging between 400 to 800 cases a year. It is also one of the highest scoring, with an average score slightly above 97 from Robert Parker throughout its history, a remarkable feat. The 2012 and 2013 vintages in Napa are emerging as all-time classics, with parallels being drawn to the 2009 and 2010 vintages in Bordeaux. As such it comes as no surprise Parker scored Scarecrow 2012 98-100 from barrel in October 2013. We are able to offer a small parcel of 2012, which has just become physical, at the market lowest price of £1,150 per case of three bottles. 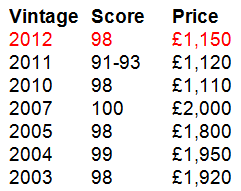 Compared to similar scoring vintages this is incredibly low priced and destined for a sharp price correction. The 100-point scoring 2007 vintage retails for £750/ per bottle in the UK while the 99-point 2004 retails for £650 per bottle: we are offering the 2012 at £383 per bottle. In Parker’s original tasting notes he states that Scarecrow 2012 is ‘Another blockbuster potentially meriting a three digit score.’ It is highly likely therefore that Scarecrow 2012 will eventually be marked up to 100 points, so this offers great investment potential for those who can obtain this and store it for a few years. Aside from being highly allocated and hugely desirable, Scarecrow is mentioned in the same breath as cult California Cabernets such as Screaming Eagle, yet it remains about 1/3 the price. Moreover, its history is as rich and layered as the wine itself. Although Scarecrow winery was founded in 2002, the vines date back to the 1940s. In 1943, Joseph Judson Cohn, the famous MGM executive producer of The Wizard of Oz and Ben Hur, purchased a 79 ha property in Rutherford, adjacent to the Inglenook Winery. Soon after, his friend John Daniels, who had convinced Cohn to buy the land in the first place, agreed to manage the estate. Together they planted grapes and the vineyard soon became known as one of the leading terroirs in Napa Valley. As a result the fruit has been used by Inglenook, Opus One and Phelps Insignia. Today Scarecrow is recognised as having some of the oldest vines in the Napa Valley. When the prevalent thinking in Napa was to replant vineyards with European rootstock, John Daniels kept the original rootstock. This was considered risky at the time, but paid off when phylloxera destroyed the replanted rootstocks. As such Scarecrow’s vines boast some of the only vines from 1945 in the world. In 2009 these old vines poetically led to the creation of the most expensive bottle of Cabernet Sauvignon ever sold, with an auction lot of five cases of Scarecrow selling for $80,000. Two years later, five cases sold for $125,000, firmly establishing it as one of Napa’s cult Cabernets. In 1996, Cohn died at the age of 100 and his heirs put the property up for sale to help resolve an inheritance dispute. From 1996 to 2002 the value of the property rose from an estimated $4 million dollars to $33.6 million, when Francis Ford Coppola of the Rubicon Estate Winery bought the estate in a packaged deal with Cohn’s grandson, Bret Lopez. Coppola received 140 acres, while Lopez and his partner Mimi DeBlasio received the property’s buildings, 25 acres of planted vineyards and 2 acres of the original Cabernet vines planted in 1945. Lopez immediately employed the revered winemaker Celia Welch to create Scarecrow Cabernet Sauvignon. The name Scarecrow pays homage to one of the most popular characters in the Wizard of Oz.